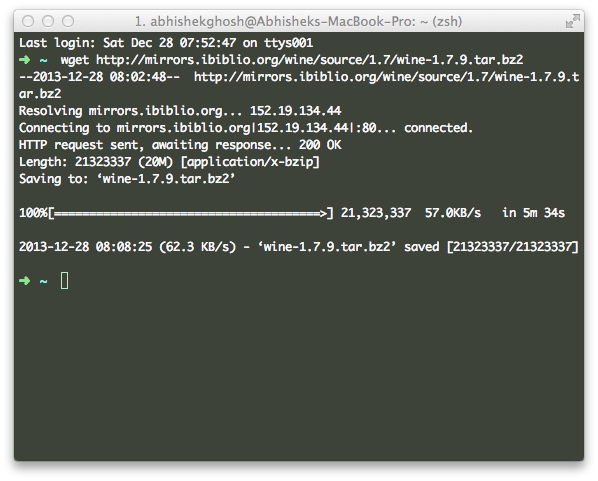 Installing Wine on OS X might appear difficult to the new UNIX users or those who are not used with Command Line Works. Here is a Step by Step Guide with Video. We previously described the methods to install Wine and Winebottler on Mac OS X – that is not mandatory to read for going through this guide, although it is good to at least have a quick look on that article before installing Wine on OS X. Official guides and supports are usually for MacPort users, however, we have shown here for the HomeBrew package manager users. It is obvious that, for this case too, you can install apt-get for OS X and symlink properly to get Wine up and running. Fixing UNIX Commands After OSX 10.8 Updates describes all the needed components for installing wine via HomeBrew. The missing component there is XQuartz, you must follow the guide on Links CLI Based Browser With Graphics to properly install XQuartz – it is again important, because the content writers in most websites do not know how to adapt with the changes after Apple has withdrawn support for X11. The remaining part is Wine, for what Installing Wine on OS X Step by Step Guide is intended for. Launch XQuartz and check the version. In fact, if you have not updated, XQuartz will prompt you. After performing these tasks; do a clean restart. This will detect and report any existing issues. If you have major issues, correct them, you can omit which are written as “Consider to…”. They are likely to get corrected when you will fix the major issues. INSTALLER-Name.exe is the .exe file’s name, usually they are setup.exe. It will normally open a Windows line installation window. If sudo throws error, omit it. Just use make command. Now you can use it. The video will be included sooner. This Article Has Been Shared 155 Times! Best Podcast Equipment for Great Sound Recording – So far, you will go through the articles publishers are full of Affiliate links. No affiliate links on our articles and we have talked about the Pricing, Technical and Practical Aspects. SSH to Server Without Entering Password From Mac (OS X) – Known Method, We Practically Do It, But Problems are Common. Here is a Full Guide. Cite this article as: Abhishek Ghosh, "Installing Wine on OS X Step by Step Guide," in The Customize Windows, December 28, 2013, April 21, 2019, https://thecustomizewindows.com/2013/12/installing-wine-on-os-x-step-by-step-guide/.